Tens, if not hundreds, of thousands of primates are traded every year, and the number's been growing linearly for 15 years When I read that news in a recent study by Vincent Nijman of Oxford Brookes University, I was not surprised. Having worked and traveled in Africa, the Amazon, and S.e. 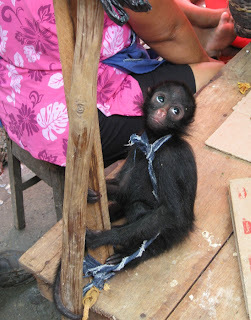 Asia, I've seen for myself that legal and illegal trade in primates is rampant. I've communicated with Nijman several times over primate issues; he seems to be one of the most knowledgeable academics alive on the subject of primate trade in S.e. Asia (and maybe elsewhere as well). Nijman's article ("Primate conservation: measuring and mitigating trade in primates") is the overview article to a new issue of the open-access journal Endangered Species Research. This particular issue is the result of a recent conference and is devoted entirely to primate conservation. In Nijman's introduction, he and co-authors write that the international trade in primates -- for research, pets, meat, etc.-- is one of the biggest threats to primate conservation. Habitat loss and hunting are the main threats to primate survival in the wild, but trade is a leading threat for some species, such as the slow loris and Barbary macaque. During the 1990s, numbers of wild-caught and captive-bred primates traded were roughly equal, but afterward captive breeding increased substantially. By 2005, around 71,000 live primates were traded internationally, 53,000 of them reported as captive-bred. However, some of the captive-breds may have been laundered wild-caught specimens. Since 1995, China and Mauritius have supplied more than half of all primates traded internationally (31% and 18% respectively). And guess who is the largest importer of live primates? 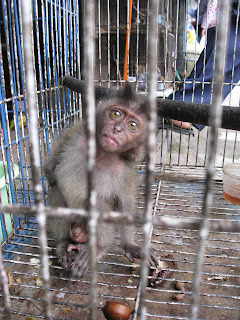 I'll give you a hint - a country with thriving medical research and a poorly regulated pet trade. 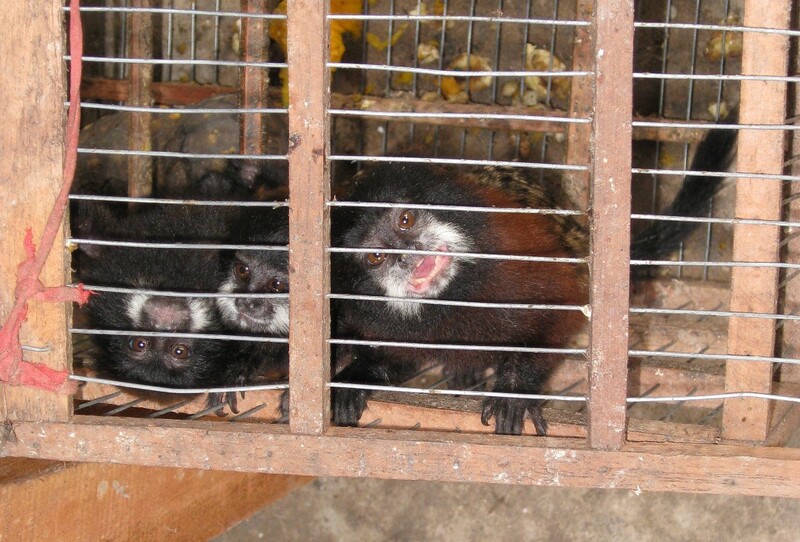 Yep, the US imports the most live primates (26%), with Japan (14%) and China (13%) close behind. 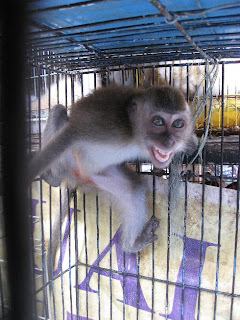 Although I knew about the trade in live primates, I was shocked to read in Nijman's paper that more than a million dead primates are traded every year. The trade in dead primates and primate parts includes almost 20,000 exported as hunting trophies over the past 30 years. The dead also include more than 100 primate species used in traditional medicines (based on cultural superstitions).The journal mentioned above contains a paper by Starr et al. 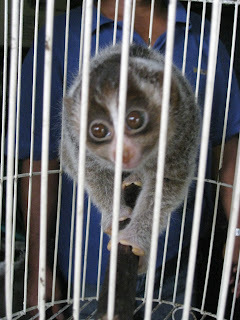 documenting the threat posed to two slow loris species in Cambodia from such trade. 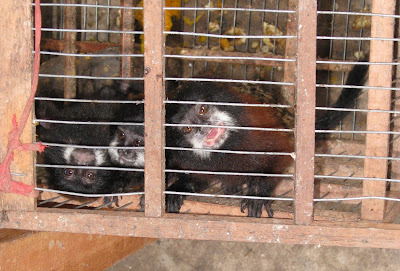 However, the major trade in primates is in those traded domestically for food. A paper by Wright and Priston in this same special issue examines what drives such trade in southwestern Cameroon and concludes that many more primates are sold there for wild meat than are captured for local consumption. Examples of illegally traded primates include long-tailed macaques from mainland S.e. Asia (Cambodia, Laos, Viet Nam) into China, to supply the booming biomedical trade. 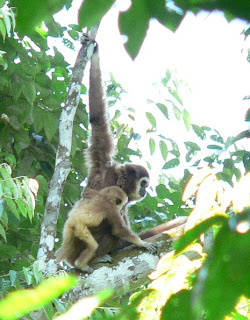 A paper in this special issue by Maldonado and co-workers documents the illicit trade of over 4,000 night monkeys (Aotus spp.) each year from Peru and Brazil into Colombia to supply a biomedical research facility. “The above figures are from an analysis of legal trade reported to CITES [the Convention on International Trade in Endangered Species of Wild Fauna and Flora], but the true figures are likely to be higher, because of under-reporting and illegal trade,” says Nijman. As Nijman et al. 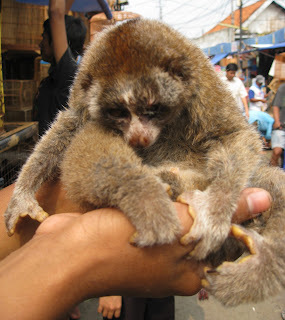 note, in 2006, trade was listed as a threat to only one of the world’s most threatened primates species, but four years later, trade for meat, medicines and pets is implicated in the decline of nine of these species. Other papers in the special issue include one by Chris Shepherd of TRAFFIC Southeast Asia on the illegal primate trade in Indonesia. He also contributed as a co-author to an article on gibbons in zoos and rescue centers in Indonesia. Chris is an impressively diligent and persistent wildlife-trade researcher and writer for TRAFFIC in S.e. Asia. He was a big help to me in preparing for my own travels there. 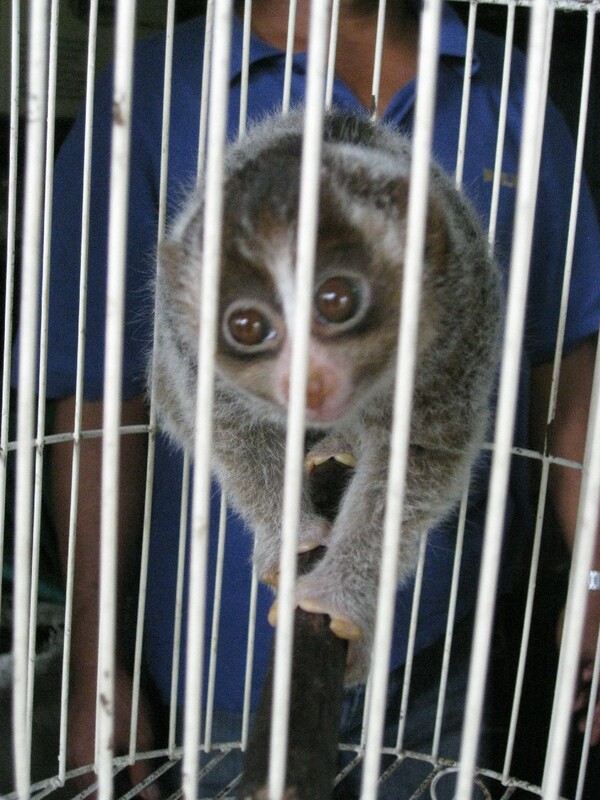 “The illegal primate trade in Asia is decimating populations of some of the region’s most charismatic species: tackling such trade should be regarded as an urgent priority for wildlife enforcement agencies in the region,” said Shepherd. Other topics covered include effective implementation of CITES; the use of forensics in trade; problems, pitfalls, and successes of rehabilitating and reintroducing confiscated primates; and educational and livelihood strategies to mitigate trade. To access and/or download the full contents of the Endangered Species Research issue on primates (discussed above), click here. Tests performed Saturday food supply found radiation in spinach from farms six 60-75 miles south of Japan's stricken reactors. 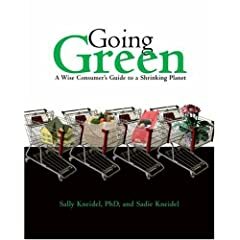 Radioactive iodine in the spinach exceeded government safety levels three to seven times, reported food-safety officials. High levels of radioactive iodine are linked to thyroid cancer. Milk at a dairy 20 miles from the leaking reactors was found on Wednesday to contain small amounts of iodine-131 and cesium-137. The milk and spinach are from an agriculturally rich area, so the radioactive contamination could affect the food supply for large areas of Japan. Chief Cabinet Secretary Yukio Edano said that more tests are being done on other foods, and if more contamination is found, food shipments from the area will be halted. He also insisted that the contaminated foods "pose no immediate health risks". More than 7,600 people were killed by the earthquake-spawned tsunami that knocked out the nuclear reactors. More than 11,000 people are still missing. 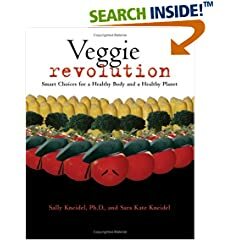 Lions extinct in 10-15 years? That's the prediction of National Geographic explorers-in-residence Dereck and Beverly Joubert. The couple have studied and filmed Africa's big cats for more than 25 years. They say that wild lions have declined from 400,000 in 1960 to around 20,000 today. Based in Botswana, the Jouberts have a new documentary and a companion book, both called "The Last Lions" (see link below). This latest film follows a solitary female lion in the Okavango Delta of Botswana as she tries to feed and protect her three cubs after her mate dies. Female lions usually live and hunt in a group, with a single male as protector against intruding males. A solitary female alone is at a serious disadvantage. Females do virtually all the hunting for a group, and they usually hunt cooperatively. Males that are part of a pride seldom hunt, but share in the females' kills. 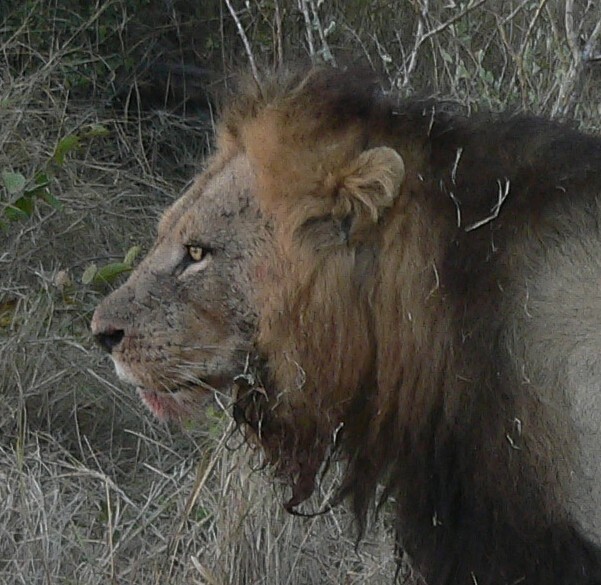 The conspicuous black mane helps protect a male's neck during fights with rivals, but makes it difficult for him to creep toward pray unnoticed. Mortality is much higher in males than in females. Africa's lions are threatened primarily by habitat loss, as human populations expand. 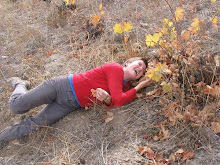 They're also frequently poisoned or trapped by rural dwellers who blame lions for livestock losses. I've been to South Africa a couple of times in the last 5 years looking for wildlife. Although I spent virtually all my time in Kruger National Park and other wildlife reserves, I saw very few lions. In eight weeks of searching, I had only three lion sightings: one solitary male, two males on a kill together, and one pride of females with their young. One wildlife guide I talked with told me that, in his youth 40 years earlier, he had shot lions every single day - to protect his family's livestock, he said. This was in the same place where I saw only one lion over a period of 3 weeks. The Jouberts were interviewed on March 2 by Terry Gross, host of NPR's "Fresh Air". Click here to read NPR's summary of the interview, or to listen to the entire interview.